It was about this time last year that we made pierogies for the first time. They turned out quite well but given how busy we always seem to be on weekends, they are a pretty time consuming undertaking. Earlier this year I suggested to SP that we use one of his winter-time 3 day weekends to again make pierogies and he agreed. I also suggested that we invite my mom to help and he agreed. Mom might not roll out dough or pinch dough together but she is excellent at clean up. My dad dropped her off early one morning in January (yes, this post has been in drafts for quite a while!). Of course mom and dad were looking forward to payment for her assistance - payment in the form of pierogies. 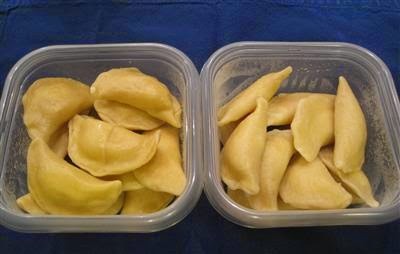 Since we were going to eat some pierogies that week, give some away, and wanted some for the freezer, we decided to make a batch of the same pierogies as last year plus try a second "kind" of pierogie. By kind I mean a different dough, not filling. 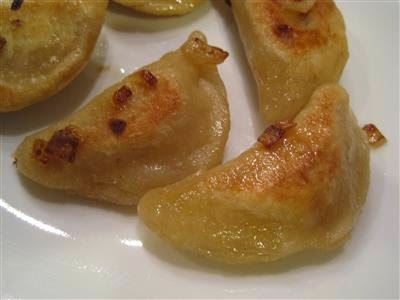 Last year we made a dough with sour cream in it and while the pierogies were really tasty, I'm not sure that adding sour cream to the dough is very authentic. I did some research. I founds of lots of recipes. Doughs with varying amounts of flour, water, egg/no egg, oil/no oil, milk, butter - kind of overwhelming! I finally settled on a recipe I found at Brown Eyed Baker. The one she tried is a Cook's Illustrated recipe. We find that the Cook's Illustrated/America's Test Kitchen recipes always turn out tasty, so we decided to try it. The finished pierogies: King Arthur Flour version on the left, Cook's Illustrated on the right. KAF has sour cream, butter, and an egg. CI has egg and egg yolk, water, and oil. SP did the rolling and he found the CI version a bit more difficult to roll. The dough was "springier" - every time he rolled it out and stopped to cut, it would sort of shrink again. I didn't notice a difference when filling and pinching shut. There is a difference in taste, though. My parents like the KAF verison better. SP does, too. In some ways I do as well. It's a little more flavorful and the sour cream really adds to the taste. However, in terms of what I think authentic pierogies should taste like, I think CI's version really hits the mark. There's something about that dough that really pleases me. It fries up a little crisper and flakier, I think. 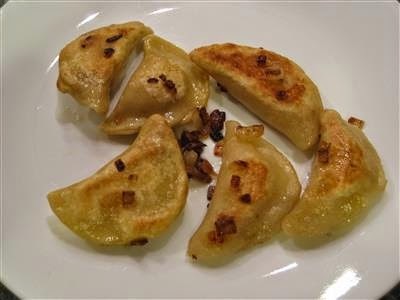 Both versions are very tasty and make satisfying pierogies. Both freeze well. And I think from now on, we'll have to make both versions. With an extra helper in the kitchen, it's much easier to crank these out. *We made our own version of the filling again, the same as last year. We added a bit more sauteed onion to the filling this year. *We had leftover filling, on purpose, because we wanted to make a few twice baked potatoes for the freezer. We had enough for 8 twice baked potatoes and gave my mom some of those, too.